Fashion & style are wonderful ways of personal expression, but sometimes the price tag is not so wonderful. At this time in my life, I don't have $1,000 to casually spend on a purse. It would be a not-so-casual experience. I'd have to plan out how to pay car insurance, food, & rent in order to purchase said bag. I don't know if that would be the best choice. I prefer to find quality products at reasonable prices. With that said, I'd like to introduce you to the best bags under $50! I am the type of person who likes something colorful, fun, & whimsical. 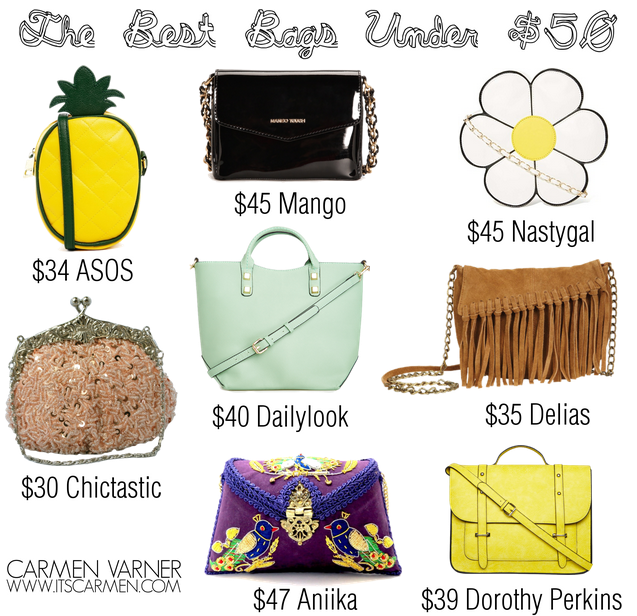 The pineapple ASOS bag & the daisy Nastygal purse are two of my favorites. They are spunky & interesting. If I saw someone walking down the street with either of these, I would stop them & ask where they made their purchase, or just silently stare in awe. The Delias fringe bag is ideal for that cool, laid back girl. This looks something you could rock to a music festival or with cowboy boots. The beaded Chictastic bag is really neat. The details are what make it amazing. From afar it looks relatively simple. As you get closer, the purse starts to shine & all the beading & sequins come to light. Obviously, the purple Aniika bird clutch is for that bold girl who really likes something unique. The pineapple one is so adorable but I also really like the bag from Aniika! The mint bag is by far my favorite - love these budget options! I LOVE that yellow satchel! I love the one from Deliias. That's a great post and the bags are great. Keep up the good work. Giveaway on my blog - win a 100 € voucher! I love all of these bags! And I have the last one in white instead of the yellow! It's in my latest post. 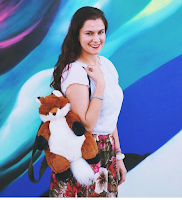 Such a great bag for carrying everything around in the summer. Also that daisy one is SO cute! The pineapple one is so cute! That daisy bag is amazing! Thank you so much for this post!! They are all so cute (and low priced)! !